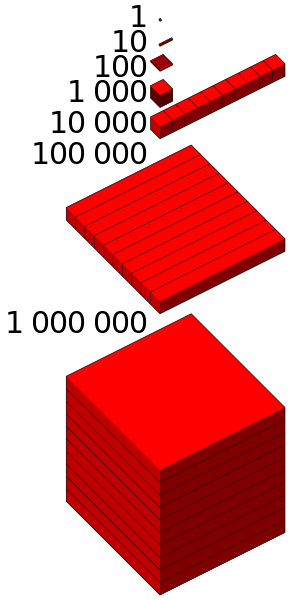 Volume: The cube root of one million is only one hundred, so a million objects or cubic units is contained in a cube only a hundred objects or linear units on a side. A million grains of table salt or granulated sugar occupies only about 64 ml (2.3 imp fl oz; 2.2 US fl oz), the volume of a cube one hundred grains on a side. One million cubic inches would be the volume of a small room only 8 1⁄3 feet long by 8 1⁄3 feet wide by 8 1⁄3 feet high. In Indian English, it is also expressed as 10 lakh or 10 Lac. Lakh is derived from 'laksh' for 100,000 in Sanskrit. 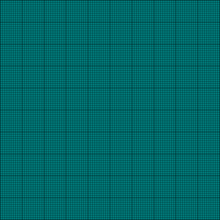 1,000,000 pixels (Resized; click to enlarge to original size).